Just want to let you know that my partner gave me [your book] How to Retire Happy, Wild, and Free for Christmas, with some trepidation because I'm already a 'free spirit'. This one book purchase has produced many ripples. As a psychologist working with a medical organization I have recommended a selection of your books to my patients who are experiencing excessive stress on the job. Some of the seeds 'took' and those folks, in turn, have been recommending your books to their friends and co-workers. So this one book purchase at Christmas has probably produced approximately 50 purchase so far. 10. You know something important that the hard workers of this world don't know: the secret to a happy and fulfilling life is to work smart and not hard. I took early voluntary retirement from the Mail Service after thirty plus years when I was fifty seven. My kids bought me your book, The Joy of Not Working as a gift on the day I finished. Mind you I was happy to take E.V.R. and I agree with everything you say !! In fact if I'd known that retirement was going to be this good I'd have done it the day after I left school. !!! I wanted to drop you a quick note to let you know how much I enjoyed reading The Joy of Not Working . Your voice is a refreshing change from the 'work harder and buy more and more stuff' voice that seems to pervade western society. A simpler approach and enjoying life is far more attractive to me. Last month, when I was crawling home from the office an idea came into my mind: why not enter that little bookstore and find "a paper remedy for depression." I had recently become an unbearable bore and was constantly in low spirits. The reasons were as follows: dissatisfaction in life, monotonous daily routine, creative deadlock and the irrepressible flow of time. I took the book from the shelf, turned over several pages (without paying much attention to its title as I always do), smiled to myself and purchased it. “Here is pleasant fiction to refresh my head” I thought. Today I finished reading The Joy of Not Working to know for sure that I am not an office clerk any longer (I took an unpaid leave to think it over)! To sit in that cramped room and see piles of papers, to communicate with colleagues and clients, to print offers of service is not for me. One should make sense of life and use every minute of it because the very existence is the most generous gift of God. Thank you very much for the road to my dream! I would like to thank you for writing such marvelous books. 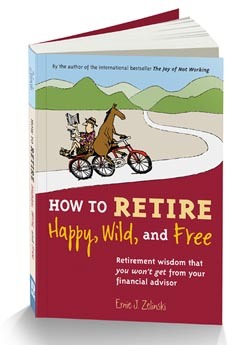 I first came across your book How to Retire Happy, Wild, and Free, while browsing in the finance section at the local bookstore, Barnes & Noble. For the past year, I have been going to bookstores almost every weekend. Lately, I have noticed more and more that reading books provides tremendous stress relief. It is especially nice to do on a hot summer day, and there is no admission charge. 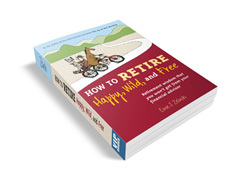 When I started reading How to Retire Happy, Wild, and Free, it was an instant hit, as I kept thinking that this book was written especially for me. I agreed with 95% of your ideas and suggestions. After reading the first chapter, I decided to purchase the book because I was compelled to highlight certain sections, so that I could re-read them. After I finished the book, I wanted to read your earlier book, The Joy of Not Working, which was equally enjoyable. I am considering part-time work as transition into retirement. Your two books have encouraged me to take the next step. It appears that you are preparing to publish additional books, and I will look out for them. 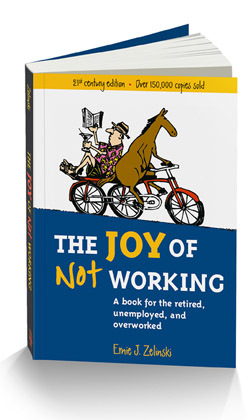 Illustrated by eye-opening exercises, thought-provoking diagrams, and lively cartoons and quotations, The Joy of Not Working is a provocative, entertaining, down-to-earth, and tremendously inspiring book that will help you get more joy and satisfaction out of everything you do. "An excellent, best-selling, well-written and savvy book on a subject that's near and dear to our hearts, and very much in the spirit of our organization. The margins are chock full of thought-provoking quotes, Calvin & Hobbes cartoons, and amusing illustrations. We can hardly recommend it highly enough!" Certain retirement “experts” advocate that people change their retirement plan and work as long as possible instead of taking early retirement. This is supposed to keep their minds in better shape. In fact, working at a job, instead of retiring as early as possible, could have the opposite effect. According to a recent study reported in the Journal of Epidemiology and Community Health, British civil servants who retire as early as possible may have better mental health than their counterparts who stay on the job as long as possible. Researchers used questionnaires to compare civil servants who retired at 60 with those who kept working. Surprisingly, they found that mental health and agility improved among retirees but declined among workers. “Mental decline can be caused by chronic tress,” stated one of the researchers, "and it is possible that such stress in some of those who continued to work accounted for the decline in mental functioning."